In conjunction with last week's release of the Austen in Austin Volume 1 compilation came the individual release of the first four of eight novellas. 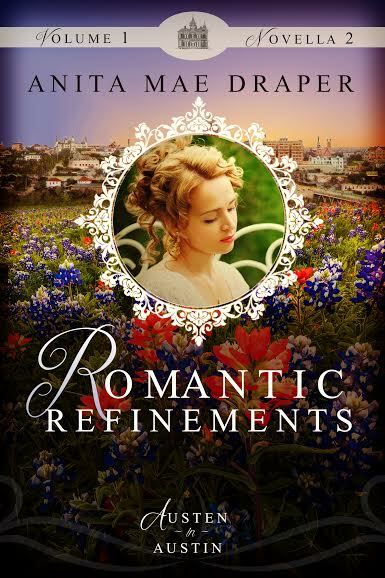 My novella, Romantic Refinements, stands second in the order of stories. This wasn't something I planned, but came about because that's where things in my story fit into the overall timeline. However, we weren't just satisfied with writing eight novellas . . . we wanted them to connect in some way. 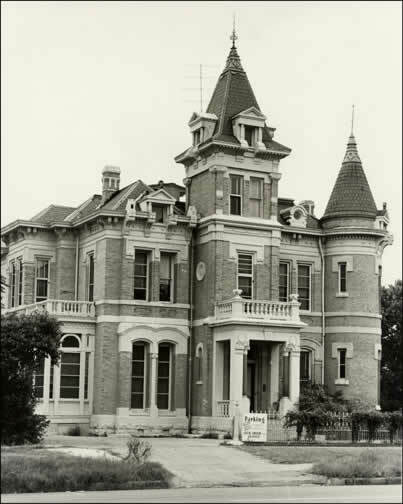 The answer was to use a common denominator - in this case, the Jeannette C. Austen Academy for Young Ladies - a place we affectionately called, Austen Abbey, where all of our young heroines would pass on their way to becoming young ladies of distinction. Our goal was for every reader to be content upon reaching the happily-ever-after at the end of a novella - no matter which individual novella they read. That was a good goal, but we also wanted our stories to intersect in such a way that if a reader read all of the novellas in order, they wouldn't just get a satisfying read, but would get a richer experience and be left a dreamy feeling of cherished love and . . . hope. Not only did we connect the first four novellas in Volume 1, but characters appear throughout all eight novellas which took coordination, a spreadsheet, and lots and lots of emails. In Romantic Refinements, I have a little girl who shares two scenes with my hero, the retired Texas ranger Brandon Tabor. One is a cute scene, one is full of danger. 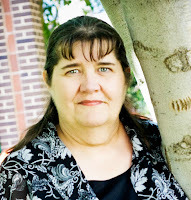 I could have written the scenes with any little girl, however, during a flurry of emails with the rest of the authors, Lisa mentioned that her heroine, Evangeline Bennett, would be about the right age to be the little girl in my novella. Not only that, but the events that happen to her - called little Eva in my novella - will have a profound effect on Evangeline's life as you'll see when you read her story in the eighth novella, Lisa's Sense and Nonsense. 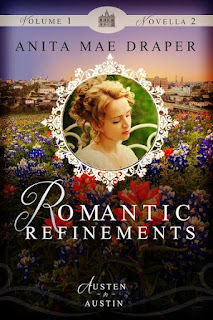 One thing I should note here is that it wasn't just the authors who worked to include characters from the other novellas, but when I received my first edits from the WhiteFire editor, she was the one who suggested that I include Eliza Branch and Mrs. Collins in my novella. The easy part was finding a spot to add them. Keeping their characters true was harder, but again, cooperation and communication created consistent characters. The end result is that a person from any novella may pop into a scene, either for a cameo appearance, or to enable a reaction that may not happen until several novellas later. That's the surprise element of the Austen in Austin novellas. I believe that this project has been satisfying to us, the authors, because we've interacted with each other to create diverse, memorable characters. I can only hope that our excitement is transferred to you, our wonderful readers. 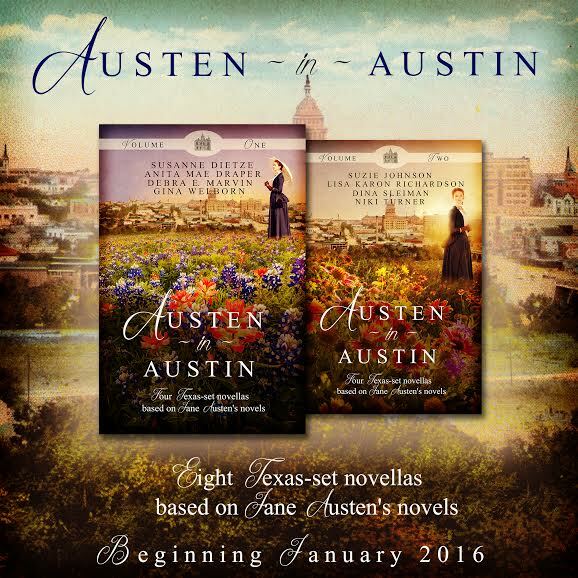 For more information on Austen in Austin and our individual novellas, check here. 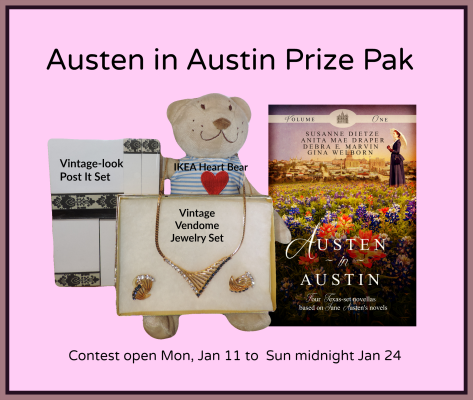 Giveaway on my blog - Win an Austen in Austin Prize Pak - Deadline is Sunday midnight, January 24, 2016. Check my blog for details. Really? I didn't realize you added it, but that sounds like a great idea. I love it when stories work with the time they're set in. I hadn't considered using Mrs. Collins until Dina suggested it. I think because there were so many emails flying back and forth about her description and character that I didn't want to get it wrong. But then you came out with that one email that said it all, and she became so clear in my mind. Thank you! Niki, you said it right there. This was a fun project for sure, but I feel honored to have my name on these books alongside the rest of you. We got a double blessing out of it... while creating the stories, and then reading them after. We will forever be tethered because of this project. Yay! I love the way you tied all the novellas together in this post, Anita. Congratulations on your wonderful novella!